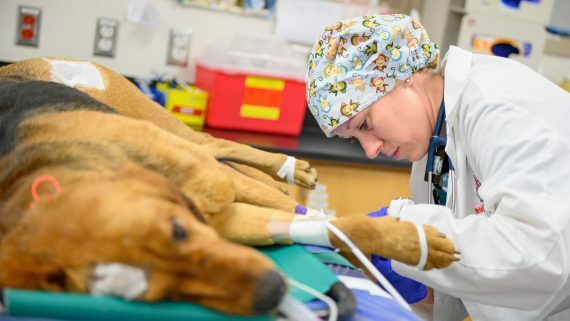 A South Carolina police dog found shot last week has returned home following successful orthopedic surgery at the NC State Veterinary Hospital. 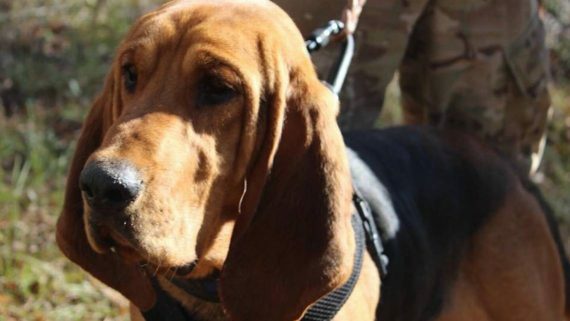 Kilo, a 2-year-old tracker bloodhound with the Marion County K-9 Unit, was referred to the veterinary hospital after suffering a gunshot wound to his femur. During the three-hour surgery on Thursday, the hospital’s orthopedic surgery service, with lead surgeon Andrea Tomas, placed a permanent stainless steel plate and pin in Kilo’s femur and removed bullet pieces. Tomas said it appears the bullet hit the bone directly and shattered, leading to extensive soft tissue damage. 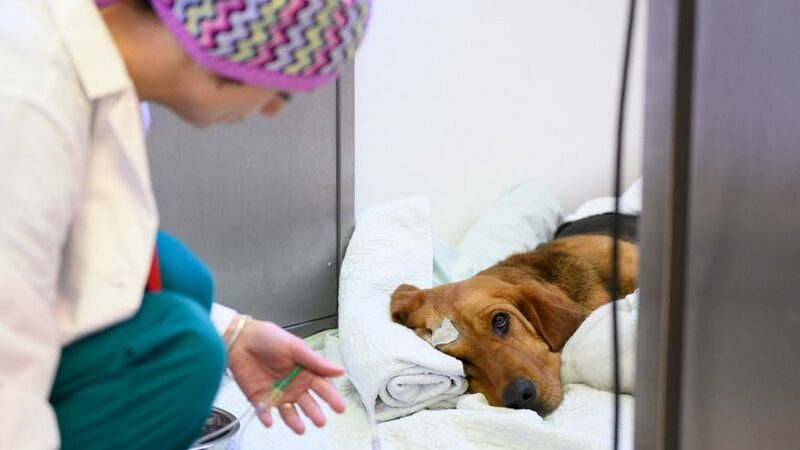 Tomas, a clinical veterinarian of orthopedic surgery who also works in the hospital’s rehabilitation and mobility service, said Kilo did well soon after surgery — awake, alert and aware of his surroundings on Friday morning. Kilo was discharged Monday afternoon and will return to the NC State for a check-up in eight weeks, said Tomas. If all is well, Kilo’s handler can start to slowly re-introduce him back to his work, she said. Prepping for surgery: during the three-hour procedure, the hospital’s orthopedic surgery service placed a permanent stainless steel plate and pin in Kilo’s femur and removed bullet pieces. Kilo is trained to track fugitives, missing people and lost children, and the K-9 Unit said they hope to have him tracking again full time by the end of the year. Last Tuesday, Kilo reportedly escaped from his enclosure and was soon found “mercilessly shot” in his rear femur. At the time, he was wearing an orange collar identifying him as a Marion County Sheriff’s K-9. 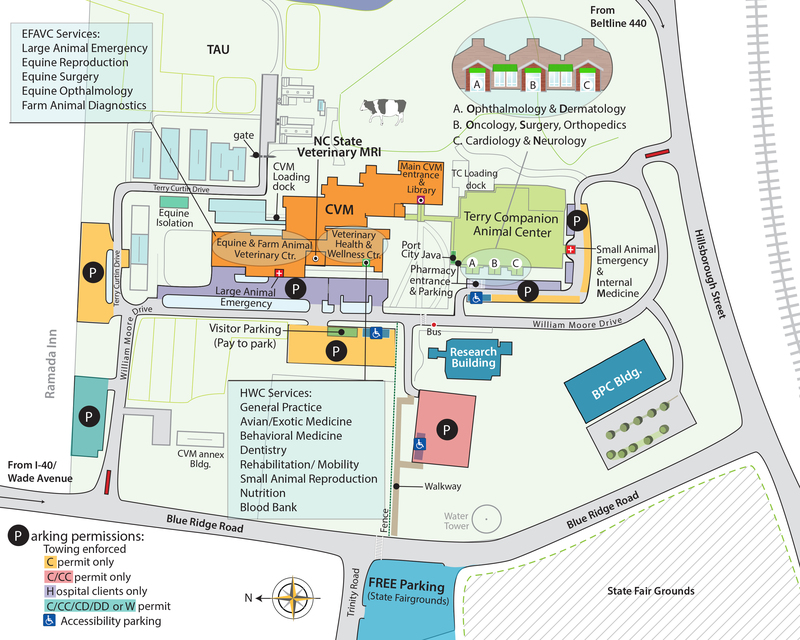 A local veterinarian referred Kilo to NC State for emergency treatment. Marion County is 156 miles south of Raleigh, about halfway between Florence and Myrtle Beach. Kilo. Photo courtesy of the Marion County Sheriff’s Office K-9 Unit. Kilo is the newest addition to the sheriff’s office K-9 Unit, joining late last year, and has already made a huge impact, Wallace said. Kilo’s sweet disposition makes him a popular dog for officers to take with them on school visits. “Children love to pet his floppy ears, and he relishes the affection,” said Wallace. A post on the K-9 Unit’s Facebook page announcing that Kilo was recovering after surgery has nearly 200 comments from people closely following updates on his condition. “Please have your human message me if there is something you would like while you heal up,” read one comment. “We sincerely appreciate the meticulous care he has received thus far and look forward to working together in the future as Kilo progresses in his recovery,” said Wallace.